L’Osservatore Romano reported August 18, 2017, on the “countdown” event planned for Monday, August 21, 2017 in preparation for the World Meeting of Families (WMOF) to be held in Dublin from August 21-26, 2018. Archbishop Diarmuid Martin, President and host of WMOF 2018, and Father Tim Bartlett, Secretary General of WMOF 2018 will host the countdown event at the Shrine of Our Lady of Knock in Knock, County Mayo, Ireland. 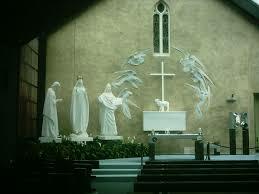 Saint Pope John Paul visited Knock in 1979, the centenary of the August 21, 1879, apparition in the village. During the apparition, 15 people from the village of Knock in Co. Mayo, witnessed an Apparition of Our Lady, St. Joseph, St. John the Evangelist, a Lamb and cross on an altar at the gable wall of the Parish Church. The witnesses watched the Apparition in the pouring rain for two hours, reciting the Rosary. Although they themselves were saturated not a single drop of rain fell on the gable or vision. Families from across Ireland have been invited by their diocese to come to Knock on August 21 to be part of the celebrations for the official launch of the preparatory program and to mark the one year countdown to next year’s WMOF 2018. Fr. Bartlett will deliver a workshop entitled ‘Glued to our phones; can we make technology more family friendly?’ And Arch. Martin will preside at Mass in the Knock Basilica where he will preach the homily on the theme “When Plates Fly: Pope Francis on the joys and challenges of family life”. This Mass will be concelebrated by bishops and priests from across the country. The WMOF 2018 Icon of the Holy Family will be unveiled and anointed at this Mass and it will then begin its journey around the dioceses of Ireland. The official prayer for WMOF 2018 will be presented at this Mass. Also being launched on August 21is the Amoris: Let’s talk Family! Let’s Be Family! program. Using a range of online and parish-based resources, this program will offer families, parishes and wider society an opportunity to think about and discuss the Catholic vision and hopes for family and marriage, particularly in light of Pope Francis’ The Joy of Love (Amoris Laetitia), his 2016 Apostolic Exhortation on love in the family. The World Meeting of Families was established by Pope Saint John Paul II in 1994. Held every three years, it is a major international celebration of faith bringing together families from across the world to celebrate, pray and reflect upon the central importance of marriage and the family as the cornerstone of our lives, of society and of the Church. Pope Francis chose the Archdiocese of Dublin to be the host diocese for the 2018 World Meeting of Families, guided by the theme “The Gospel of the Family: Joy for the World”. National Opening of World Meeting of Families will take place simultaneously in the twenty-six dioceses on the island of Ireland on August 21, 2018. From August 21-24, a three-day Congress will include workshops, talks and discussions centered on the theme: “The Gospel of the Family: Joy for the World”. The Congress will also offer a program for young people to include faith and fun activities for children. Festival of Families, which will be held on Saturday, August 25. This will involve a cultural concert within a prayerful and joyful atmosphere, during which personal stories of faith will be shared by families, each representing the five continents; and. Holy Mass for WMOF2018. A solemn Eucharistic Celebration on Sunday August 26 will involve thousands of pilgrims from Ireland and around the world.